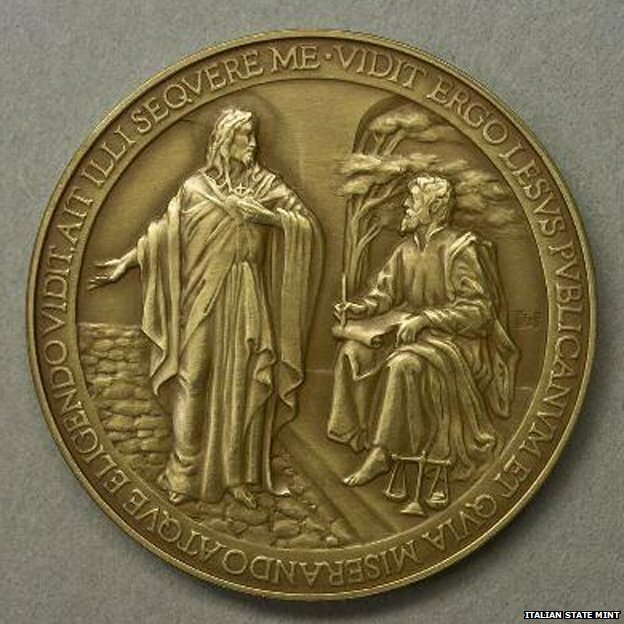 The Vatican has withdrawn from sale 6,000 copies of a new papal medal on which the name of Jesus was misspelt. In an inscription around the edge of the coin, Jesus was spelt with an L instead of a J.
Keen-eyed experts snapped up a handful of the coins, which were struck in gold, silver and bronze by the Italian mint, before the mistake was noticed. Vatican coins and medals bearing the face of Pope Francis are bought by collectors all over the world. A few collectors may make a fortune because of the scarcity value of the flawed medals, the BBC's David Willey reports from Rome. As news of the mistake travelled, social media users cracked jokes about this new religious figure, "Lesus" Christ. "I blame the Lesuits," went one tweet while another had "Let us prey Lesus".